I'm stuck in New York. There's apparently a hurricane hovering over my head and Delta airlines thinks it's a bad idea to fly during a hurricane. 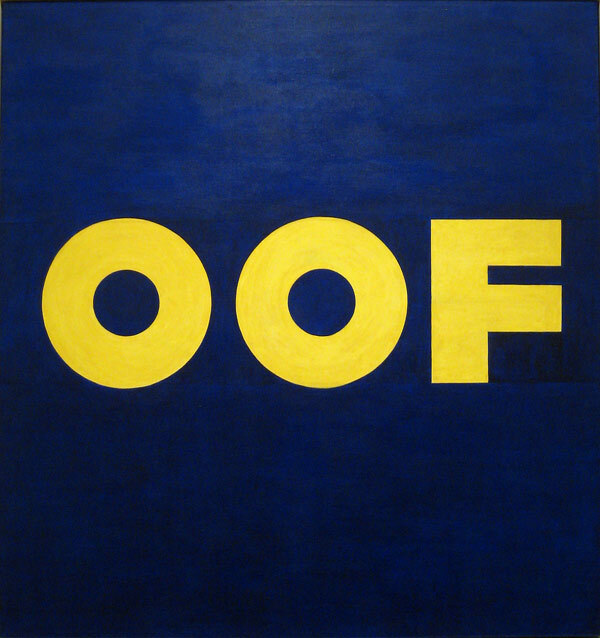 On Sunday, my girlfriend and I went to the Museum of Modern Art where, inexplicably, you can take pictures of their regular collection. Feeling despondent for most of the day, we came across the Ruscha above. Appropriate. This post is going to be short because I plan on running through the abandoned streets of Manhattan soon, but Saturday sucked. Al Borges is officially on Greg Mattison "Your Schemes Don't Work" watch and Michigan's receivers appeared to have it in for Russell Bellomy and refuse to catch his passes. Winning the Big Ten may be out of reach. 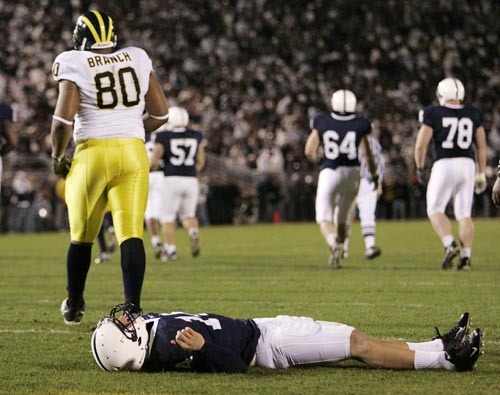 Rooting for MSU and Penn State is now Michigan's only way to make it to Indianapolis, that is of course, if Denard Robinson isn't broken forever. 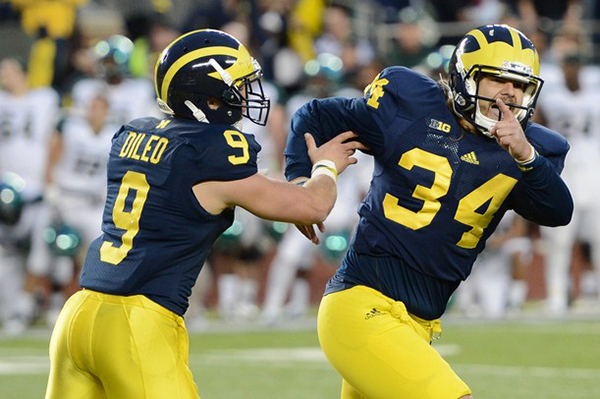 The only good news is that Michigan's defense is for real, which we probably already knew. Coverage this week will be spotty because of travel complications. Through 55 minutes and 50 seconds last week, Nebraska had amassed a total of 387 total yards of offense against Northwestern, but managed only 16 points, thanks in large part to two lost fumbles. In its last two full drives, Nebraska racked up 156 yards, almost all on the arm of Taylor Martinez (11/13 for 143 yards and 2 TDs). For the game, Martinez threw for 342 yards on 39 attempts (8.8 YPA) and three touchdowns. On the ground, Martinez added 65 yards on 18 carries. Defensively, Nebraska mostly shut down Northwestern's rushing attack. Venric Mark was able to rack up 116 yards on 18 carries, but he was the only one and largely because of an 80-yard run on a blown play by the Nebraska middle linebacker Will Compton (the team's leading tackler). Northwestern's offense isn't what it has been the last few years, but holding them to only 301 yards is still an accomplishment. Since Michigan's offensive output generally comes down to how well Denard will fare in the passing game, Nebraska presents a unique problem: the Cornhuskers rank eighth in the nation in sacks with 21 total (3.14 per game). The charge is led by senior weakside defensive end terror Eric Martin (pictured). Martin has 5.5 sacks and 8 TFLs already this season. He also has 7 QB hits, one forced fumble, and one fumble recovery. Shutting down Martin will be critical to winning this game, so expect Devin Funchess or another tight end to line up next to Schofield all game, forcing Martin to rush against Taylor Lewan. Martin isn't the only pass rusher, though. 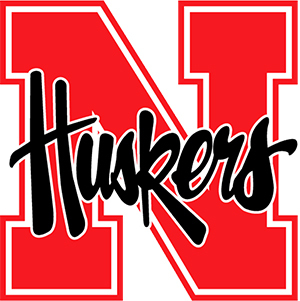 There are four different players on the Nebraska roster with at least two sacks this year and 13 with at least a half of a sack. 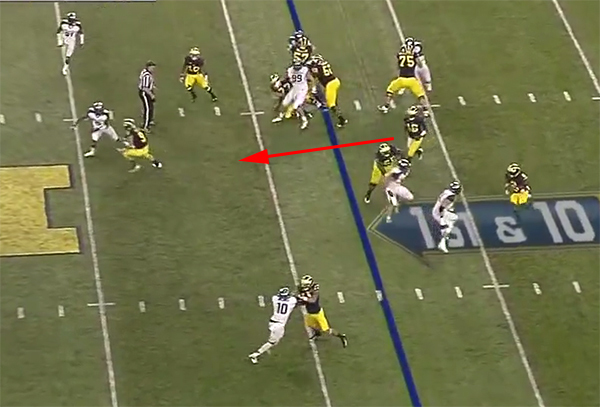 For a quarterback who is prone to backfoot throws when he gets pressure, this kind of pass-rush spells doom for Michigan. Nebraska is able to generate that kind of production because they play a lot of man coverage, both in its base formation and blitz coverage (though they don't blitz much). The 80-yard touchdown run that Nebraska allowed against Northwestern was the direct result of Will Compton being pulled to the flat trying to cover running back leaking out of the backfield. If anything could be gleaned from last week's matchup, it's that Nebraska is susceptible to counters and misdirection because of their aggressive man defense. Despite all of the man coverage, Nebraska is an impressive 18th in pass efficiency defense. Michigan's receivers are going to struggle to get off the line against the Cornhusker cornerbacks. Josh Mitchell and Stanley Jean-Baptiste both play strong man coverage, and Michigan's wide receivers have had trouble with physical corners. Safeties Daimion Stafford and PJ Smith are also decent in coverage but are more of a factor in the run game, ranking second and third in tackles. Victimizing Nebraska's safeties and linebackers with play action is something Northwestern did often last week. Al Borges probably won't want to do this. Those safeties have to be aggressive against the run because defensive tackle Baker Steinkuhler is a wiry 6'6" 290 lbs. That's one of the reasons that Nebraska is 90th in rushing defense this year. The other reason: if you make it past the defensive line, as long as you've spread the field, there's a good chance you're not going to see another defender until the safeties come into play. 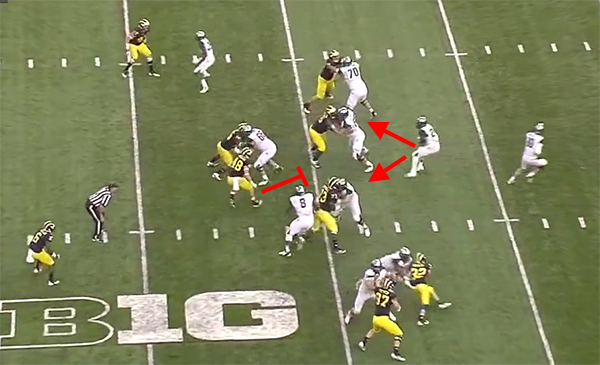 Making the proper reads in the option game and getting some blockers to the second level will be crucial for Michigan to spring big plays. The best part about playing against Nebraska this year as opposed to 2011: no Lavonte David, the team's unquestioned leader and best defensive player last year. David stopped quite a few Denard runs last year from being 80-yarders with shoestring tackles. Despite generally solid linebacker play, if Michigan can get Denard or Toussaint in space against these linebackers, that's a win for the Wolverines. You know Taylor Martinez, but you might not know 2012 Taylor Martinez. Though he's still not an elite passer, he's been significantly better this season, completing 67% of his passes for 8.7 YPA and a 15 TD/4 INT rate. Those are some scary numbers. However, his stats are significantly worse against teams with respectable defenses (UCLA, Wisconsin, Ohio State; 49/85, 57.6%, 574 yards, 6.75 YPA, 3 TD/4 INT). It will be interesting to see what Michigan can do against Martinez. When he has time in the pocket, Martinez can make all of the throws, but Nebraska ranks 76th in sacks allowed. 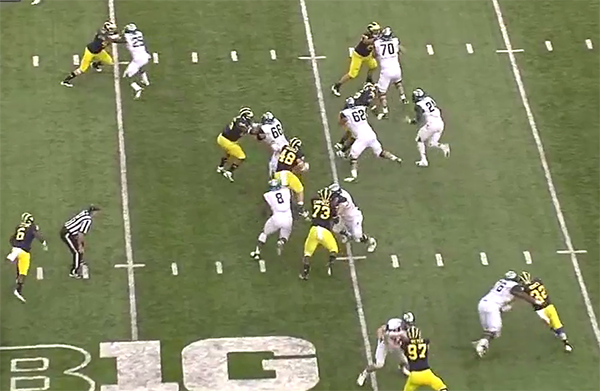 The problem is, Michigan can't generate a pass rush without blitzing. Greg Mattison finding ways to confuse Martinez without giving up too much in the run game may be the most important task he has all season. Nebraska's rushing attack is still elite, averaging 279 yards per game (good for 6th in the country). Rex Burkhead is coming back from a leg injury that kept him out of a lot of the Northwestern game. Last year, Burkhead was the hot commodity coming into Nebraska's game against Michigan, but managed only 36 yards on 10 carries. Martinez wasn't much better on the ground or through the air, but the latter of which we've already addressed. 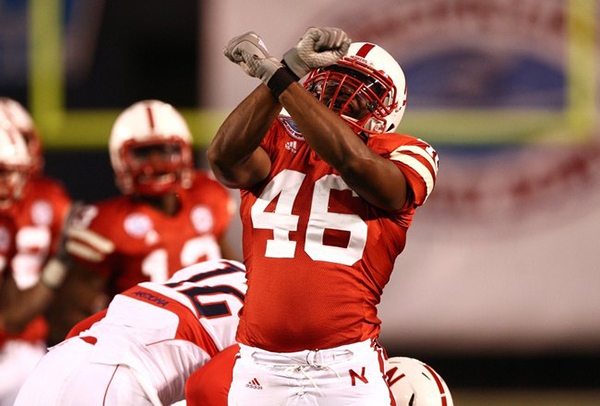 I'm frankly not worried about Nebraska's rushing attack (famous last words, I know). I have implicit faith in Mattison's ability to scheme for and prepare his players for any offensive attack that can't simply overpower Michigan with talent (see: Alabama). Mattison knows how these spread attacks work because a) he was Urban Meyer's defensive coordinator at Florida and b) he goes against Denard Robinson in practice every week. The key to winning this side of the ball will be the defensive line. Quinton Washington and Will Campbell are basically constants, and Craig Roh has been a good-to-great strongside defensive end. Jibreel Black and Frank Clark at the weakside defensive end will have to stay disciplined against the option and stick to whatever gameplan Mattison has designed (play the QB or the RB). If it's Black at WDE, his lack of speed may be an issue, but if Clark can step into the role, that should help nullify Nebraska speed. If the defensive line can hold up, Kenny Demens, Desmond Morgan, and Jake Ryan against running backs in space will decide how this game goes for Nebraska offensively. Though Martinez has a lot of straight-line speed and a little bit of shake to him, none of Nebraska's running backs are threatening in the open field. How does Michigan win? Getting pressure on Taylor Martinez will be crucial. 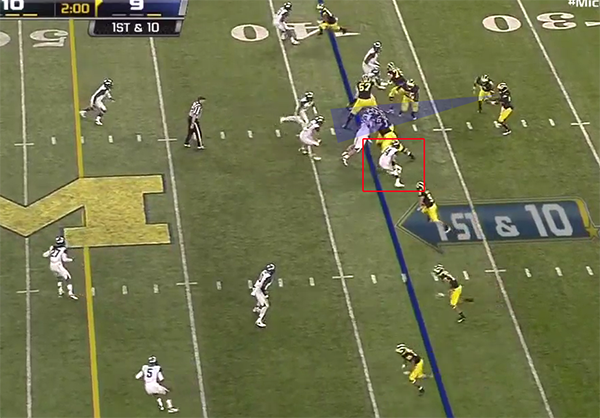 If they can force Martinez to complete closer to 50%-55% of his passes, Mattison can start loading up against the run. Jake Ryan will be responsible for a lot of this pass rush as he has been all season long. He will have to stay disciplined keeping outside leverage and make sure to wrap up in the backfield. JT Floyd and Raymon Taylor are going to have their hands full with Nebraska's taller wide receivers, which is another reason pass rush will be critical. 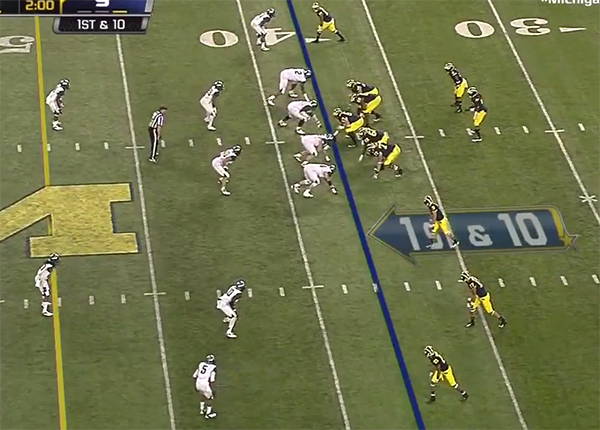 Offensively, Michigan needs to get Denard to the second level. Nebraska's linebackers are aggressive downhill and just watched Michigan run head first into MSU's linebackers for 60 minutes. If Patrick Omameh and Ricky Barnum can get to the second level and block Nebraska's linebackers, Denard will be able to pick up big chunks of yards. 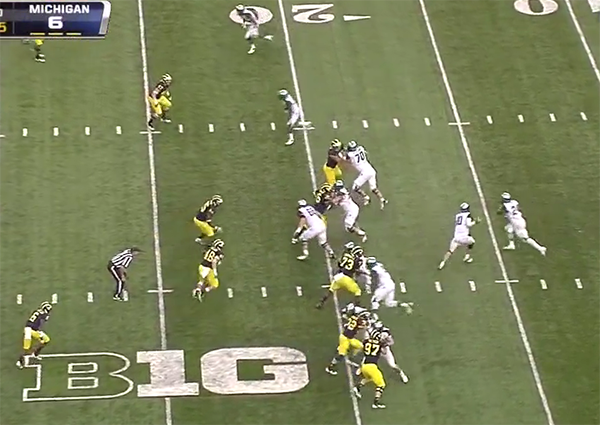 In the passing game, Denard and Borges need to find an effective way to attack man-to-man coverage down the field. How does Nebraska win? Keep doing what they've been doing. If Martinez is completing 67% of his passes in this game, Michigan is sunk. The Nebraska coaching staff varies their run game as well as almost anyone in the country. Keeping Michigan's defensive line on its heels with multiple option looks will further slow down the Wolverines' already inept pass rush. They will, however, need to find a way to get big plays from non-Martinez ball carriers. Defensively, Nebraska needs to keep generating the pass rush they've gotten all season. Though Denard has cut down his terrible, backfoot throws since the Notre Dame game, the kind of pressure Nebraska generates could see a return to that inconsistency. If the linebackers can stop Denard and Toussaint from breaking long plays, a physical secondary will be able to stop Michigan's passing game. Final Prediction. Offensively, expect Al Borges to utilize the counter draw that Michigan has shown a few times this year and last, as well as the throwback screen, both of which will punish Nebraska's linebackers for overpursuing. 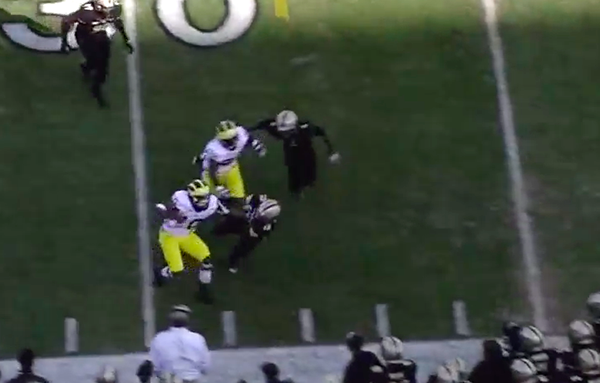 Denard and Toussaint both break 30+ yard runs as Nebraska linebackers get caught out of position. 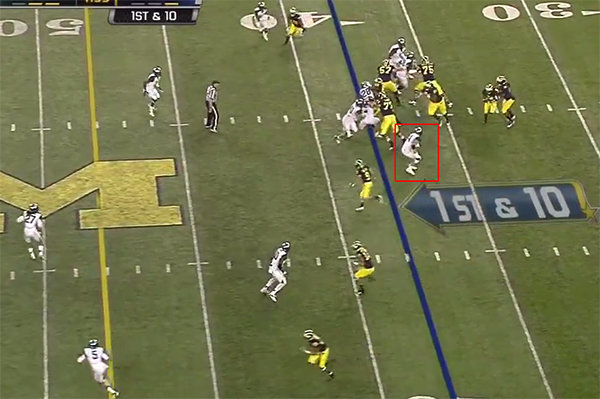 However, Denard throws two interceptions, both of which are meaningful and not end-of-half heaves. Iowa 19 - MSU 16 (2OT). Andrew Maxwell, intent on bringing back Sparty No! threw a pick in the second half of double overtime to end the Spartans bid to beat inexplicably 4-2 Iowa. Le'Veon Bell had his best game of the season and finally looked like the dangerous running back he's rumored to be but still only managed 4.8 YPC (albeit on 29 carries). Andrew Maxwell is still an inexperienced, inconsistent quarterback that is most certainly not Kirk Cousins. Against Iowa, he threw 12/31 for 179 yards and 1 INT. Maxwell has a lively arm but accuracy is a major concern. The only MSU wide receiver that anyone ever needs to be scared of is Aaron Burbridge who had 89 yards on five catches. Iowa was worse than MSU but somehow managed the win. Supposed-to-be best QB in the conference James Vandenberg was terrible, completing just 19 of 36 passes for 134 yards (3.7 YPA). Don't let those numbers fool you: not even checkdowns were a guarantee. Iowa's only running back with two legs, Mark Weisman, ran stride for stride with Bell, averaging 4.5 YPC on 26 carries. This was a game of incompetent offenses that someone had to win. Iowa was the beneficiary of the game's most critical turnover (Maxwell's in 2OT) which decided the outcome. Michigan State's defense is the only thing that's kept them in games this season because their offense is atrocious. MSU ranks 8th in rushing yards per game allowed, 12th in pass efficiency defense, and 14th in scoring defense. The other side of the coin is that the Spartans haven't played anyone this year that can really fill up the scoreboard. The only team with a respectable offense (Indiana, of all teams; 31st in points per game) put up 27 points in the first half against MSU before being shut down in the second half (more on this later). 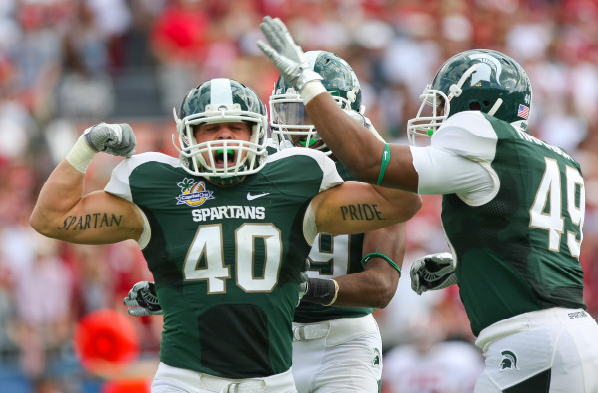 The Spartans are led, not surprisingly, by junior middle linebacker Max Bullough who has 31 solo tackles, 27 assists, 5.5 TFLs, 2 PBUs, and a forced fumble. 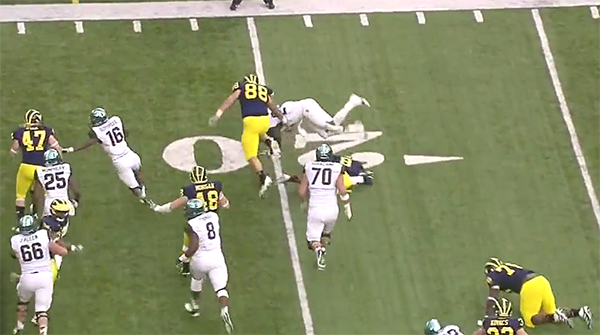 Bullough is the real deal: a great downfield run stuffer who can drop into coverage and is never caught out of position. Think Kenny Demens' ceiling. At the SLB spot is junior Denicos Allen who is the team's second leading tackler in his second year as the starter. And at the WLB position will be senior Chris Norman. Combined, the starting linebackers account for 12.5 TFLs of the team's 38. This is an aggressive, blitzing group. These tendencies were exploited against Indiana, where the Hoosiers were able to march up and down the field almost exclusively on bubble screens in the first half. 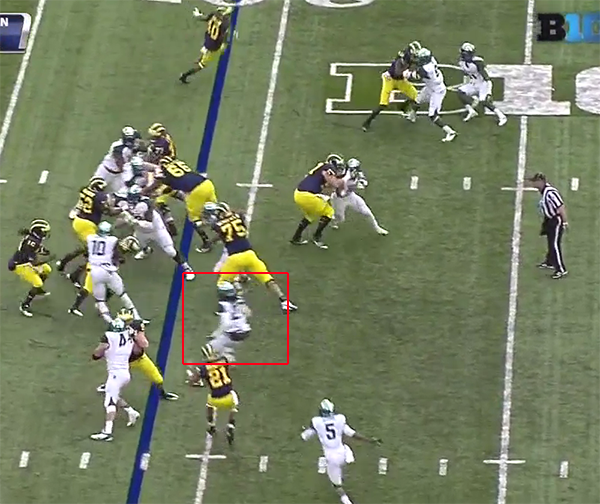 With such dogged determination to get into the backfield, MSU's linebackers are susceptible to horizontal attacks. Hopefully Al Borges was watching this game and took notes; tunnel screens back to the inside of the field are not going to end well, but throw bubbles to the boundary and Michigan could find easy first downs all game. 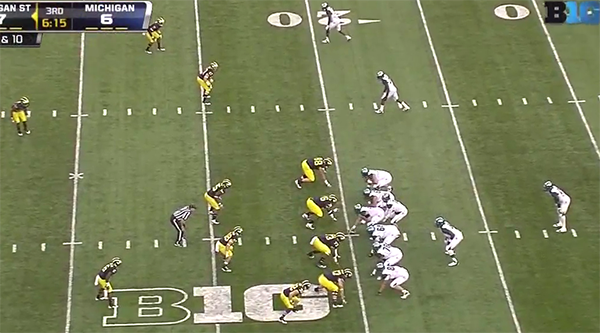 The concern for Michigan against this unit is, like last year, the double A-gap blitz that makes Denard heave balls off his back foot. These are plays that Rimington award winner David Molk struggled to block. Tasking Elliott Mealer with the same responsibilities spells trouble. To slow down Pat Narduzzi's blitzing defense as well as take pressure off the interior of the offensive line, Borges will have to use screen passes extensively. While the Spartan linebackers are some of the best in the conference, the team's defensive line is suspect save William Gholston, who you know about. The starting DTs senior Anthony Rashad White and sophomore James Kittridge are non-factors. They try to play much like Michigan's defensive tackles: consume as many offensive linemen as possible and give your linebackers a chance to make tackles. Sophomore strongside defensive end Marcus Rush is good-not-great. He's what you want out of a strongside defensive end: holds up against the run, bats down passes at the line of scrimmage, and occasionally gets into the backfield. At 6'7", 278 lbs, Gholston is pretty wiry, but he's still a terror in passing situations. Also, excellent backside pursuit is the kind of thing that can destroy an option running game or a hesitant running back (Fitz Toussaint). If Lewan can handle Gholston like he has the last two years, Michigan could dominate this defense, but with lingering injuries to Lewan, that may be a problem. In the secondary, Darqueze Dennard is one of the better cover corners in the Big Ten and could present some problems for Michigan's receivers getting open. 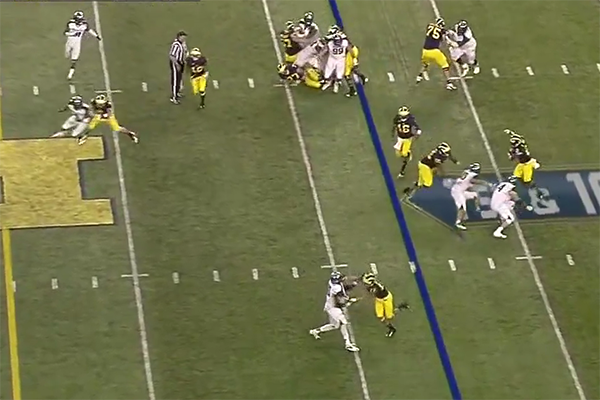 However, he'll likely be tasked with covering Devin Gardner who is a good six inches taller than him. OK, so, Le'Veon Bell. I will say this now and you will believe me later: Le'Veon Bell is not a great running back. At 6'2", 244 lbs, he's a moose, but he doesn't have the complementary speed to make him truly dangerous. He can occasionally (occasionally) make people miss in space, but otherwise, his running style is to make contact a yard beyond the line of scrimmage and rumble forward for 3 yards. You can blame his offensive line, if you want, but power running backs, regardless of their offensive line, should probably average more than 3.8 YPC against Central Michigan. Combined with a shoddy offensive line, Bell will remind you more of a third-string Wisconsin running back than similar body types from squads like Alabama. Now that I've gotten that off my chest, MSU's offense is pretty remedial, led of course by the rushing attack of Bell. MSU ranks 84th in rushing offense, 59th in passing offense, and 102nd in scoring. There are plenty of reasons that the offense struggles, but it starts with the Spartans' makeshift offensive line. Starting right tackle Fou Fonoti and center Travis Jackson have each gone down for the season with injuries. Another important injury is to starting tight end Dion Sims who was the team's leading receiver when he went down with a sprained ankle and helped get push in the running game for a mediocre offensive line. On MSU's first snap, they could be starting two redshirt freshman, two sophomores, and a fifth-year senior on their offensive line. However, Michigan State's offensive line has been a mess the last two years and each season, the Spartans have found a way to grind Michigan's front seven to dust and protect their quarterback. Though I hate this kind of reasoning, I'm glad to see Kirk Cousins go because he was one of those guys that Just Wins against Michigan. Andrew Maxwell may get the same kind of protection that Cousins got against Michigan's defenses, but he doesn't have the kind of consistency or accuracy that Cousins did. Maxwell has a lively arm but not a lot of touch and is highly erratic. He's completing only 54.3% of his passes this season and averaging only 6.28 YPA. Throw in just 6 TDs to 4 INTs and you have the makings for a not great QB. This isn't pressure-induced, either; MSU ranks 40th in sacks allowed. 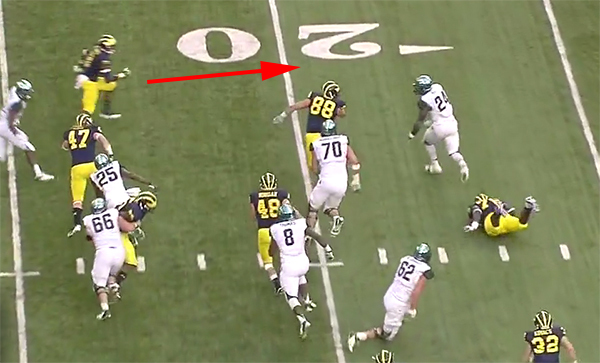 Perhaps the biggest hindrance to MSU's offense is the lackluster group of wide receivers. No longer is Keshawn Martin running jet sweeps around the edges of the defense or BJ Cunningham getting open everywhere. Though Keith Mumphrey leads the Spartans in receptions and receiving yards, the only threat is freshman Aaron Burbridge, who at 6'1" is not the Michael Floyd pterodactyl type that Michigan's secondary struggles against. 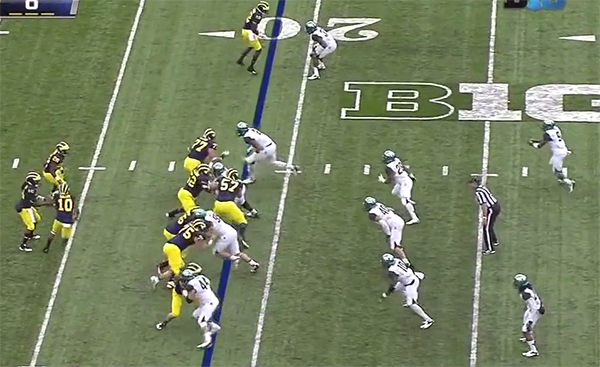 Expect MSU to try and take a few uncharacteristic deep shots to Burbridge with JT Floyd in coverage, but unless Maxwell is dropping those in his lap, Michigan's secondary will just have to concern itself with underneath hitch routes and crossing patterns. 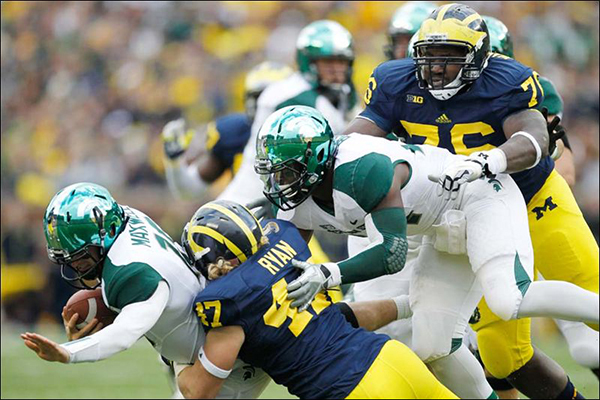 How Michigan's defensive line fares against this depleted front of MSU will determine the game. Against the run, expect Quinton Washington and Will Campbell the continue the dominance they showed against Illinois. Tightening running lanes and keeping offensive lineman at the line of scrimmage will allow the linebackers to hit and swarm Bell. 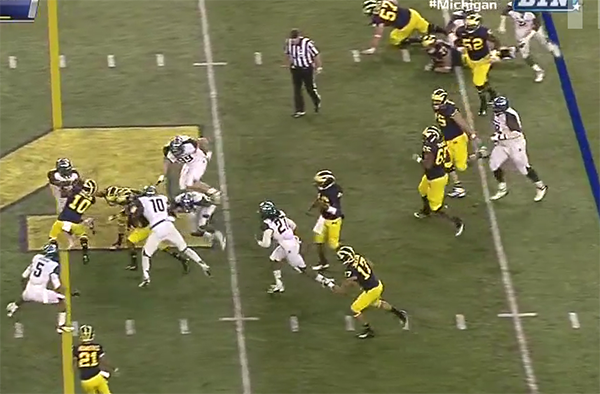 When MSU drops back to pass, I actually expect Michigan to blitz a lot less than they have in the past. With a lackluster group of wide receivers and a mediocre offensive line, the defense will be able to rely on coverage sacks rather than getting pressure with linebackers. This also helps defend against MSU's reliance on tight ends in the passing game, flooding underneath zones with linebackers. How does Michigan win? The combination of Maxwell and MSU's receivers are not a threat to Michigan's secondary, the Spartan offensive line is once again shaky, and Bell doesn't have the home-run power to get Michigan into an uncomfortable situation offensively. If the defensive linemen continue to allow the linebackers to make plays, Michigan should be able to shut down MSU's offense. 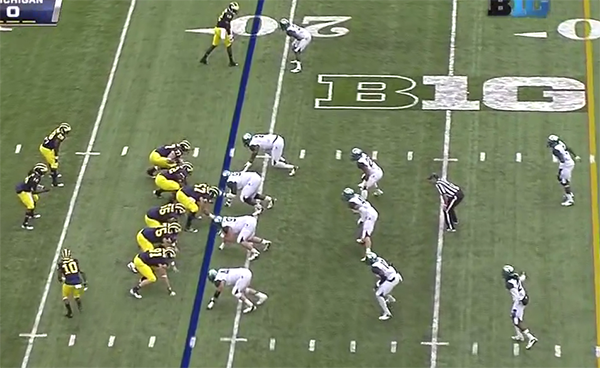 When Michigan has the ball, testing the edges of the Spartans' defense will be key to opening running lanes and getting Denard time in the pocket to throw. Jet sweeps and bubble screens should keep MSU honest while the rest of Michigan's base offense should be enough to march down the field. How does Michigan State win? The offensive line has to play its best game of the season for them to give Maxwell time in the pocket and the receivers time to get open. Le'Veon Bell will need to show that he's more than a 3 yards and a cloud of dust star and force Michigan's linebackers to commit fully to the run. This will open up passing lanes off of play action. Shutting down Michigan's offense will be harder for the Spartans. MSU's linebackers need to return on their potential and Narduzzi's blitzes will need to generate turnovers. 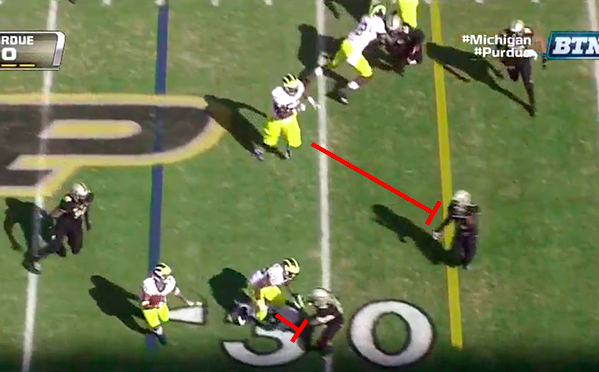 MSU can help their cause by finding a way to stop Denard on the inverted veer and forcing Toussaint to make Michigan's rushing yards. Final prediction. 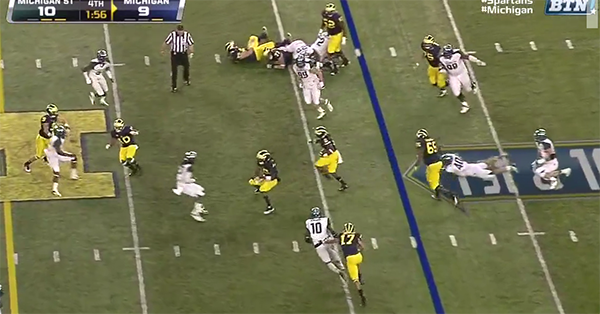 Denard's rushing totals take a major hit in this game, but Toussaint finally finds some lanes to run through. 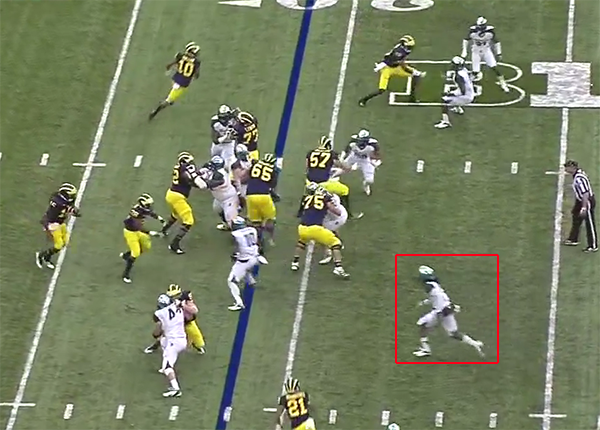 MSU understands the threat of Denard's legs and have probably gamplanned to stay home on him on all option plays. There will be a fumble generated on a linebacker blitz against an option play. Also, we'll see the return of Denard's back-foot heaves that end serendipitously, mostly thrown to Devin Gardner who makes a few astonishing catches in traffic. Illinois 14 - Wisconsin 31. Illinois has not won a Big Ten game in over a calendar year. In fact, the last time they won a game in the conference was October 8, 2011, when the Fighting Illini beat Indiana 41-20. Now, this doesn't have anything to do with last week despite the fact that they lost to another Big Ten team, this time, Terrible Wisconsin. Last week's game was relatively close until the fourth quarter. The teams were tied 7-7 going into the half with Illinois' only score coming on a Nathan Scheelhaase scramble and Wisconsin scoring on a 62-yard James White screen pass. Wisconsin was doing everything in its power to prove that it's no longer 2011 until the fourth quarter when they forced two three-and-outs, allowed only a field goal, and racked up 21 points including a two-play, 59-yard touchdown drive. Scheelhaase went 18/29 for 178 yards (6.1 YPA) with 1 TD and 1 INT. He also racked up 82 yards on 22 carries. In other words, a typical Sheelhaase day. The rest of Illinois' offense was a non-factor. Meanwhile, Wisconsin mediocreback Joel Stave was able to throw for 254 yards on only 25 attempts. Michigan 44 - Purdue 13. Last week, Michigan looked like the Michigan everyone hoped. Denard looked like Good Denard again: 8/16 for 105 yards through the air--and the best part, no interceptions--and 235 yards on 25 carries. Fitzgerald Toussaint had a rough day, but everyone else who touched the ball for the Maize and Blue found green grass ahead of them. The defense turned in possibly its best performance of the year, limiting Purdue to just 213 yards on 12 drives; they forced/were gifted four turnovers; the linebackers are finally getting to their run fills on time; the defensive line is getting push; and the secondary is continuing its aggressive man-to-man coverage without giving up big plays. BCS competition has scored no less than 31 points against Illinois in each game this year (Arizona State 45, Penn State 35, and Wisconsin 31, in addition to 52 points allowed to Louisiana Tech). Though the team ranks 38th in rushing yards per game allowed, they are 97th in pass efficiency defense; teams do not need to run the ball against the Illini because they're porous through the air. If those numbers don't prove how pedestrian this defense is, the Illini's most dangerous defender is weakside defensive end Michael Buchanan, who has 2.5 sacks and 5 TFLs. The team's leading tackler, however is strong safety Ashante Williams. I am firmly of the belief that when your strong safety is your leading tackler, that's a bad thing (see: Jordan Kovacs 2009-2010). No one will be happier to play Illinois than Fitz Toussaint. This will be the first time all year that Michigan plays a BCS opponent without multiple NFL draft picks in the front seven. Neither defensive tackle Akeem Spence nor Glenn Foster should be much of a problem for Michigan interior line to handle. Justin Staples and Buchanan aren't much for defensive ends, either (Illinois is 89th in the country in sacks). 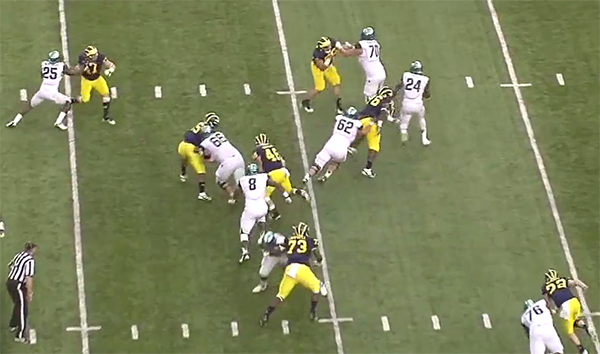 This will be a good barometer for Michigan's offensive line going forward. With only five interceptions in 6 games, Illinois' secondary isn't much to fret about, but as always, generating turnovers against Michigan comes down to getting pressure on Denard (by the way, Michigan has the highest interception percentage in the country with 8.47%; the only team even close is Auburn with 8%). With a lackluster defensive line, Illinois will likely struggle to get the kind of pressure necessary to affect Denard unless they blitz a lot. 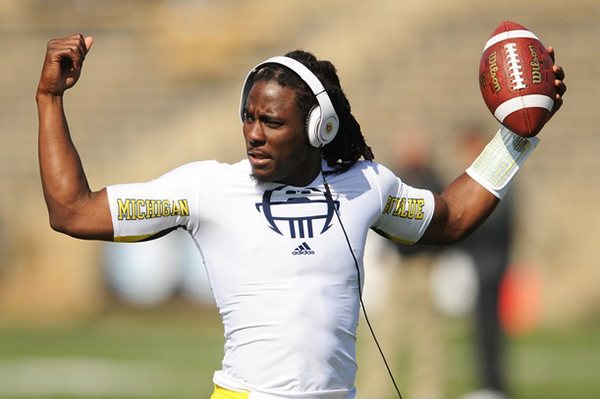 With a strong bounceback game against Purdue, Denard and Borges look to be back on the same page. Though last week wasn't Denard's best performance through the air, it was more than enough to get the job done when you're averaging 9.8 YPC. Expect a similar offensive structure this week: lots of inverted veer runs, with short passes and limited downfield shots. Borges may try to get Devin Funchess involved in the passing game a little more in this game after mostly falling off the map in the last few weeks. This can be attributed to teams actually guarding him, but I wouldn't be surprised to see a few more routes run with Funchess as the first read. So Nathan Scheelhaase is still Illinois' quarterback despite all of the available evidence against him. Dude plays like Tate Forcier, except he can't throw and doesn't look to extend plays in order to pass. So, not like Tate Forcier at all, but that's who he'll remind you of. Scheelhaase has started his third year as a starter poorly. He's completing 62% of his passes but only averaging 6.34 YPA. Add in a 3/5 TD/INT ratio and you have the makings of a disappointing junior year. Caveats for playing for a new coaching staff apply, but he doesn't look like he has a breakout performance waiting in reserves. Flanking Scheelhaase in the backfield will be a number of different players, but sophomore Donovan Young leads the team in carries with 59. Young is averaging only 3.8 YPC, but few players are doing better: freshman Josh Ferguson is averaging 4.1 YPC and Scheelhaase is averaging a career low 2.3 YPC (down a yard from 2011). This is not a good offense: 101st in total offense, 78th in passing efficiency, and 94th in rushing yards per game. The only real receiving threat on the Illinois roster is junior Ryan Lankford who is averaging 14.5 yards per catch and has 5 yards on the season, but Lankford isn't the elite-level receiver that can really threaten Michigan's secondary. 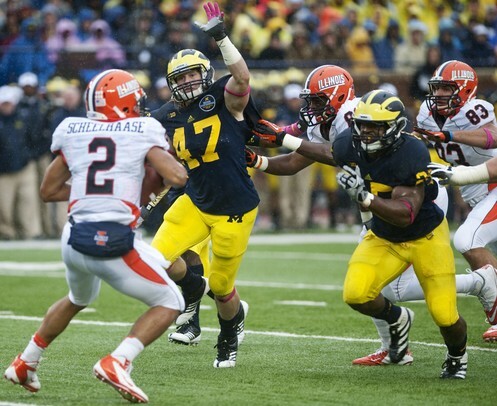 This Wolverines defense is quietly becoming elite again. It ranks 7th in passing yards allowed per game, 26th in pass efficiency defense, and 37th in scoring defense. With Mattison and Hoke capable of turning anyone over 300 lbs into a reliable+ defensive lineman, this will become a perennial occurrence. The bad news for Illinois: they rank 109th in sacks allowed this season despite having a scrambling QB and option running game. 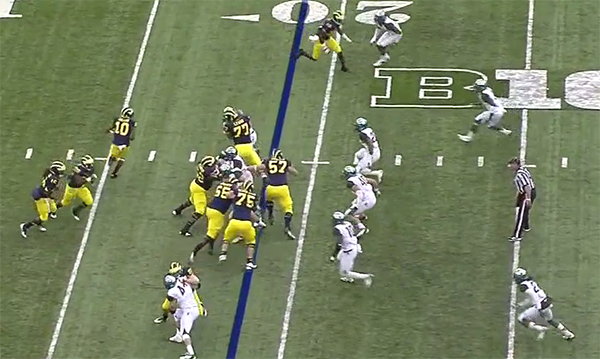 This is not a good offensive line, which Mattison will take advantage of and the defensive line should dominate. How does Terrible Illinois win? Blitz. Force turnovers. Hope for a bad day from Denard. Kickoff/punt returns for TDs. I've been critical of some of Michigan's wide receivers' blocking this season, namely Devin Gardner and Jerald Robinson. 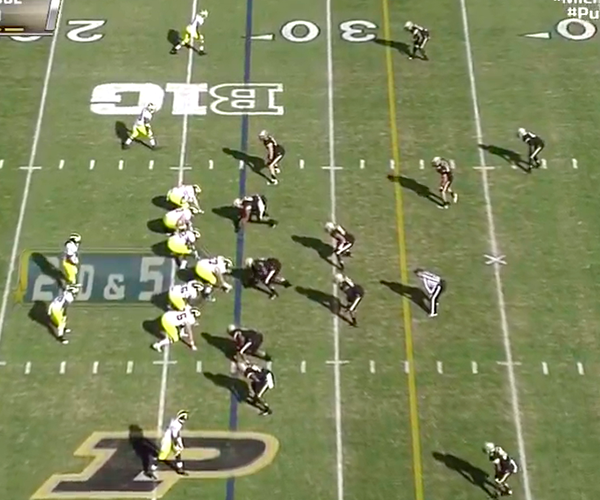 Against Purdue, Al Borges called a play in which the wide receivers were doing something in the blocking game that Michigan State used to burn the Wolverines last year: seal the playside linebackers to the inside. 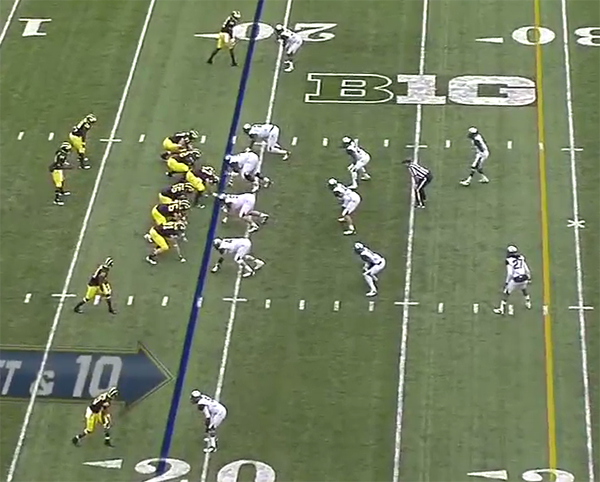 Michigan comes out in a three-WR set and will run a jet sweep for Jeremy Gallon (lined up in the slot at the top of the screen). 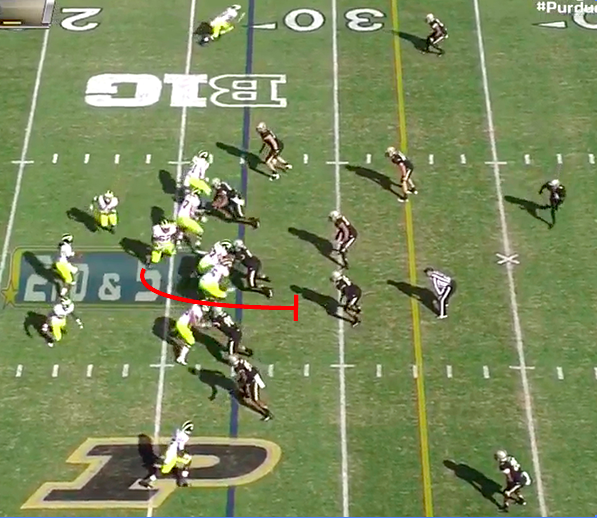 Purdue counters with 3-4 front and three-high zone coverage. 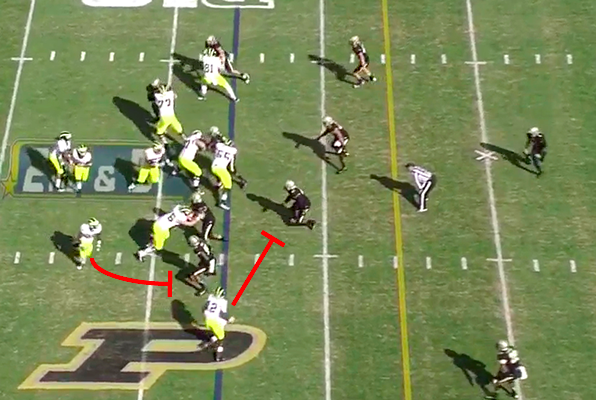 As the ball is snapped, left guard Ricky Barnum will pull across the formation and run through the playside B gap looking for a Purdue defender downhill to block. 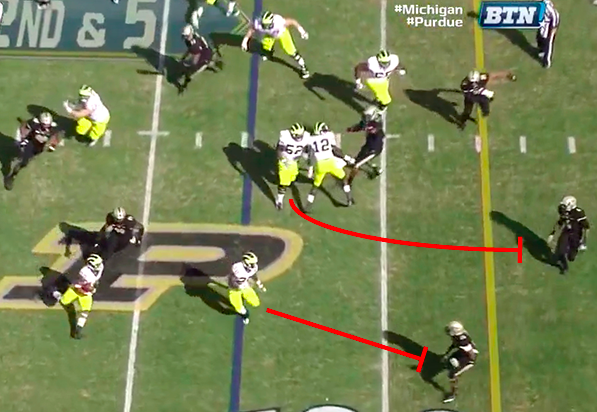 Rather than heading straight upfield to block the cornerback lined up over him, Devin Gardner (bottom of the screen) runs toward the middle of the field to block the playside ILB that is flowing down the line with Gallon. 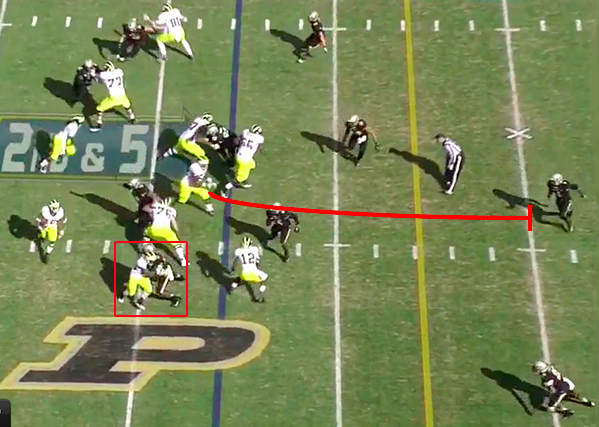 Toussaint will act as a lead blocker on the playside OLB and chip block him before heading upfield. 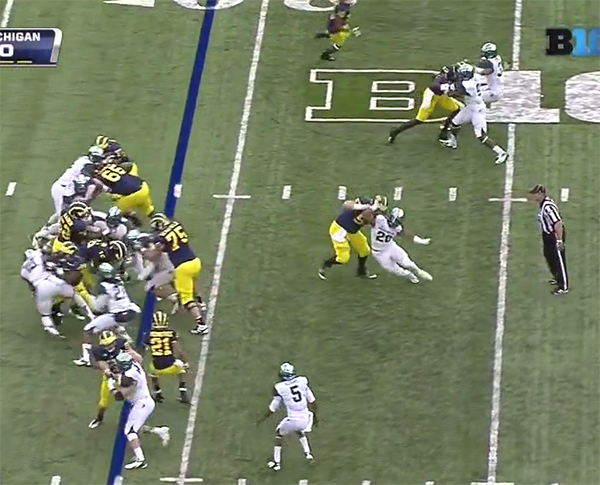 The key to this play working is Toussaint making a good chip block before heading upfield. He hits the OLB with enough force to stop him from tackling Gallon in the backfield but is able to continue toward the cornerback. Barnum is still running toward the free safety. Unfortunately, Gallon tries to bounce the play outside toward the sideline rather than cutting back inside where he had his blocking set up. 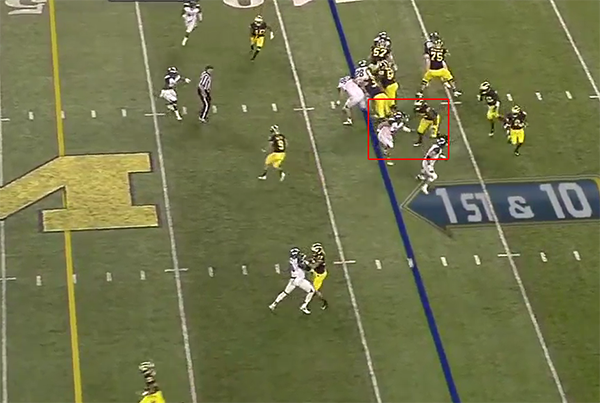 The play ends with Gallon being led out of bounds despite blocking set up to the inside. 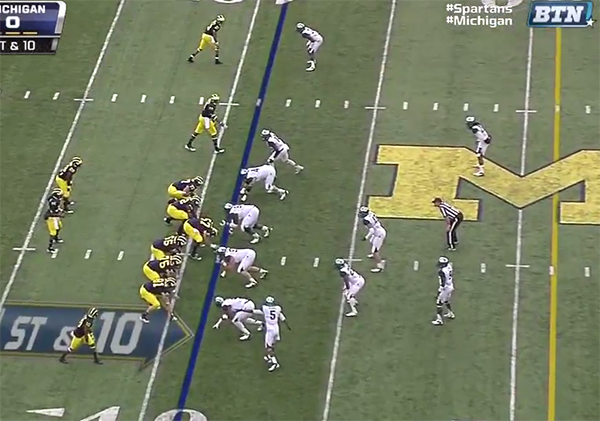 It's pretty clear why MSU gashed Michigan with this last year. If Gallon cuts back to the inside, the only player with a chance of tackling him is the backside ILB (#39) who is doing a good job of flowing downhill with the play but probably has a 50/50 chance of actually making the tackle. Borges has finally started to utilize bubble screens on a semi-regular basis, which is a great addition to Michgian's arsenal. 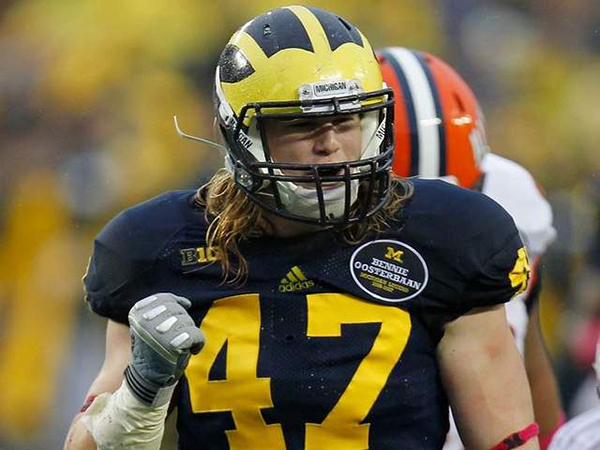 Prior to using them, Michigan rarely tested a defense sideline-to-sideline. The only other plays the Wolverines ran that did so were these jet sweeps, which always seem, at best, moderately effective. Changing up a blocking scheme to seal the opponents playside linebackers and put a ball carrier in space against a single defender is all you can ask for. It will be interesting to see how this evolves throughout the season, but testing the outsides more frequently and effectively can only mean good things for this offense going forward.